This data set provides atmospheric carbon dioxide (CO2), methane (CH4), carbon monoxide (CO), molecular hydrogen (H2), nitrous oxide (N2O), sulfur hexafluoride (SF6), and other trace gas mole fractions (i.e. "concentrations") from airborne campaigns over the Alaskan and Canadian Arctic for the Carbon in Arctic Reservoirs Vulnerability Experiment (CARVE). The CARVE flight campaigns took place from 2012 to 2015 between the months of March and November to enable investigation of both seasonal and inter-annual variability in atmospheric gas abundances. The data were derived from laboratory measurements of whole air samples collected by a Programmable Flask Package (PFP) onboard the CARVE aircraft. Air samples were collected at strategic intervals to coincide with the overflight of a ground site of interest, or when interesting geophysical conditions were encountered. While most of these samples were collected near the surface in the planetary boundary layer (PBL), on almost every flight samples were also collected in the free troposphere. A minimum of 12 flask samples were collected per flight. Whole air samples collected in the PFPs were analyzed on automated systems at the NOAA Earth System Research Laboratory (ESRL) Global Monitoring Division in Boulder, CO, which also analyzes samples from the NOAA/ESRL Global Greenhouse Gas Reference Network. The measurements included in this data set are crucial for understanding changes in Arctic carbon cycling and the potential threats posed by thawing of Arctic permafrost. There are 4 data files in netCDF (*.nc) format, one for each year of CARVE campaign flights, with this data set. Temporal Resolution: The instruments were deployed on periodic flights during the growing season (approx. March – November). Measurements were initiated by the aircraft pilot at scheduled times coinciding with overflight of an area of interest, or when interesting geophysical conditions were encountered. A minimum of 12 flask samples were collected per flight. All data are stored in NetCDF (*.nc) version 4 file format. Each file provides measurements of dry mole fractions of atmospheric CO2, CH4, CO, H2, N2O, and SF6 acquired over one year of CARVE flights. Each file contains 14 geolocation and ancillary variables and 69 science measurement variables described in Table 2. These data files contain dry mole fractions of CO, CO2, CH4, H2, N2O, and SF6 measured from whole air samples collected during CARVE flights between March and November of 2012 to 2015. These data complement high-frequency gas concentration observations from the Fourier transform spectrometer and cavity ring-down spectroscopy instruments aboard CARVE flights. These data represent one part of the data collected by the Carbon in Arctic Reservoirs Vulnerability Experiment (Miller & Dinardo, 2012). A C-23 Sherpa aircraft made frequent flights out of Fairbanks, Alaska between March and November over multiple years, observing the spring thaw, summer draw-down, and fall refreeze of the Arctic growing season. Flights concentrate observations on three study domains: the North Slope, the interior, and the Yukon River valley. North Slope flights cover regions of tundra and continuous permafrost and were anchored by flux towers in Barrow, Atqasuk, and Ivotuk. 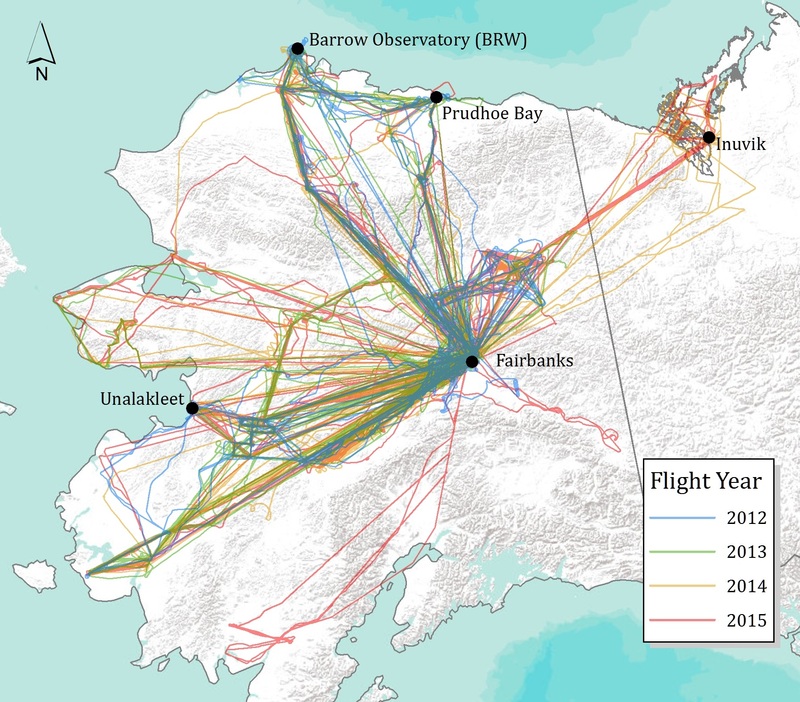 Flights to Prudhoe Bay characterize the CO2 and CH4 emissions from oil and natural gas processing plants. 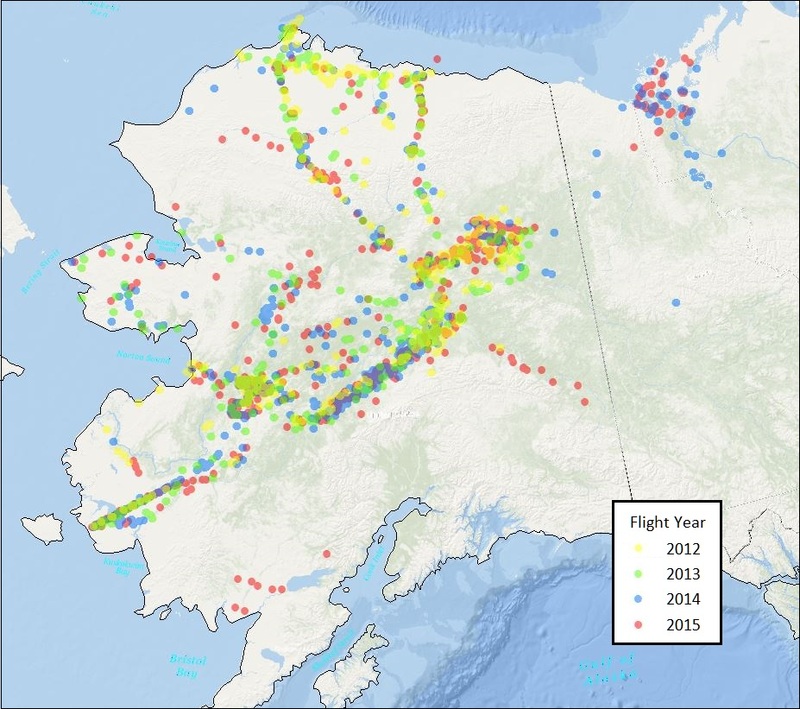 Flights over interior Alaska sample discontinuous permafrost, boreal forests, and wetlands. A complete list of CARVE flights can be found at: https://carve.ornl.gov/flights.html. Flight paths and atmospheric gas concentrations for CARVE surveys can be visualized through the CARVE Flight Data Visualization Tool (http://carve.ornl.gov/visualize) and are illustrated in Figure 2. This data set includes measurements from discrete air samples captured by the flask sampling system on board the aircraft. 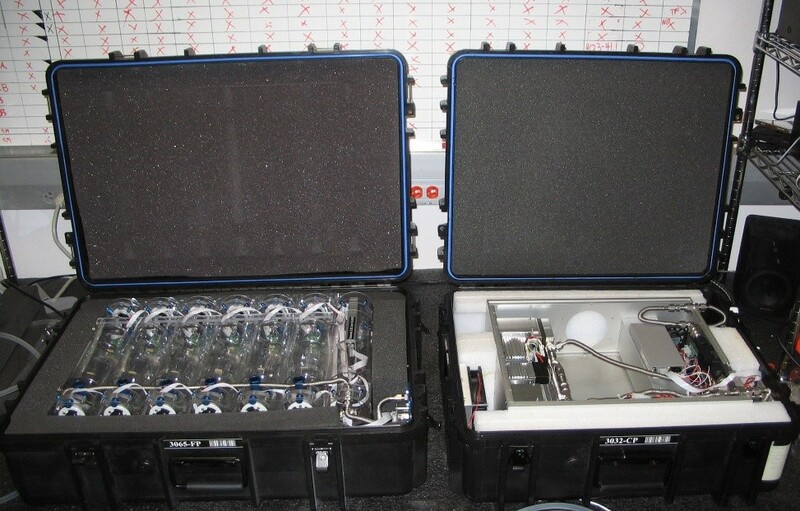 The two air-sampling devices, the Programmable Flask Package (PFP) and Programmable Compressor Package (PCP) systems, are used routinely on aircraft as part of the NOAA/ESRL Global Monitoring Division’s Carbon Cycle and Greenhouse Gases network (Sweeney et al., 2013). Quantities of CO2 in flask air samples were detected using a non-dispersive infrared analyzer and reported in parts per million (ppm). Because detector response is non-linear in the range of atmospheric levels, ambient samples are bracketed during analysis by a set of reference standards used to calibrate detector response. CO was isolated from constituent gases with gas chromatography and detected by resonance fluorescence at ~150 nm, or by reaction with HgO to produce mercury and detection through Hg resonance absorption, and reported in ppb. H2 was isolated using gas chromatography, reacted with HgO, and detected through Hg resonance absorption. H2 quantities are reported in ppb. Conway, T.J., et al. (1994). Evidence for interannual variability of the carbon cycle from the National Oceanic and Atmospheric Administration/Climate Monitoring and Diagnostics Laboratory Global Air Sampling Network, J. Geophys. Res., 99, 22,831–22,855. Dlugokencky, E.J., L.P. Steele, P.M. Lang, K.A. Masarie (1994). The growth rate and distribution of atmospheric methane, J. Geophys. Res., 99, 17,021–17,043. Gerbig, C., S. Schmitgen, D. Kley, A. Volz-Thomas, K. Dewey, D. Haaks (1999). An improved fast-response vacuum-UV resonance fluorescence CO instrument, J. Geophys. Res. 104, 1699 –1704. Hall, B.D., G.S. Dutton, D.J. Mondeel, J.D. Nance, M. Rigby, J.H. Butler, F.L. Moore, D.F. Hurst, and J.W. Elkins (2011). Improving measurements of SF6 for the study of atmosphere transport and emissions, Atmos. Meas. Tech. Discuss., 4, 4131-4163. Novelli, P.C., P.M. Lang, K.A. Masarie, D.F. Hurst, R. Myers, J.W. Elkins (1999). Molecular hydrogen in the troposphere: Global distribution and budget, J. Geophys. Res. 104, 30,427-30,444.